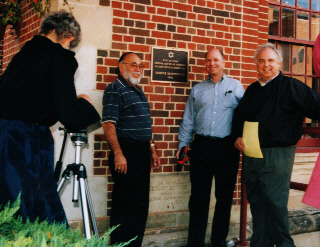 Jerry Klinger of the Jewish American Society for Historic Preservation and Ray Valdez of the Las Vegas Citizen's Committee for Historic Preservation affixed the plaque. The Temple building is owned by the Roman Catholic Church and is used as the Newman Center for Highland University. 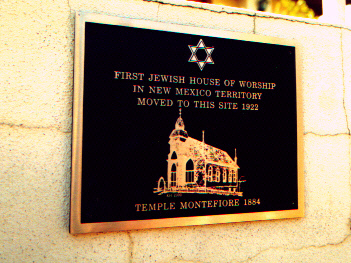 The plaque "First Jewish House of Worship in New Mexico Territory Moved to this Site 1922, Temple Montefiore - 1884." 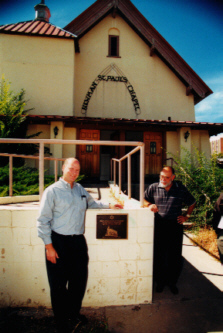 Ray Valdez, Jerry Klinger and David Scholders of the New Mexico Jewish Historical Society. The plaque is affixed to the Las Vegas, New Mexico School Board administrative building which had supplanted the original Temple building. 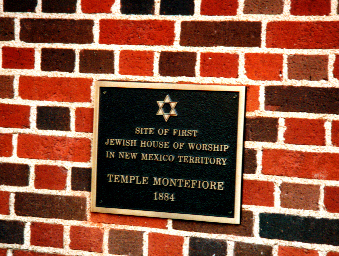 Comemorative plaque, "Site of First Jewish House of Worship in New Mexico Territory, Temple Montefiore, 1884."